Everything was excellent. The property even better then what was advertised on the website. Very pleased to have rented the cabin.Staff was very friendly and courteous. At first not going to an office to check in was a bit strange but the entire procedure with talking with the staff was very easy and simple. We spent Christmas in the Smokys and were able to enjoy both the sunrise and the sunset. We had a really great time. The view from the cabin is very beautiful. We enjoyed going on walks, taking pictures, and looking for cool rocks and leaves. The Hot tub was also very nice. On Sunday, we went to Asheville t the Chocolate Lounge and it was amazing. We loved being able to rest after the holidays! Great view and very quiet. We stayed i the cabin most of the time. We loved just doing nothing, relaxing in the Hot Tub. We loved being able to get some rest after the Holidays! Great view and very quiet. We stayed in the cabin most of the time. We loved jut doing nothing, relaxing, and using the Hot Tub. Very good experience I so happy with this company I recommend it . Very good conditions of the cabin, very well organized, it had everything you need. Loved the Shooting Star cabin, the cabin was beautifully laid out. Loved the hot tub, barbecue and fire pit . We utilized everything! We stayed for our family vacation over Christmas with our two girls, we had an awesome time - probably one of the best family memories made! We loved that the cabin was decorated for Christmas. We enjoyed the view and the fireplace. 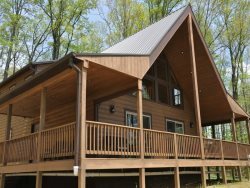 We loved everything about this cabin! The views from the deck. the layout , the hot tub after hiking! The kitchen was complete with everything we needed for a group of 12. Overall the cabin was very clean. The kitchen was perfect! It had all of the utensils needed for whipping up a great meal in the comfort of your own cabin. My family and I had a wonderful Christmas in the cabin. It was very clean. The decorations made us feel at home and ready for Santa! Everything I needed to cook Christmas brunch and dinner were provided. Even a crock pot! We loved the fireplace. We went Fishing, shopping, site seeing and hiking. The cabin was beautiful! We loved it! Everything was great. Everyone in my family was so happy. Wish we could have stayed longer.The peoplel at GSCR were friendly. The hot tub had glitched because the power flipped off and a maintenance guy come out and fixed it immediately. It was Christmas Eve! We were all so impressed. And he was super friendly! This has been a very Merry Christmas week! What a beautiful view! My daughter was so thrilled to see a Christmas tree. We couldn't have chosen a better cabin. Loved the pool table, Hot Tub and quiet! Actually played in the snow on Newfound Gap! Family vacation. We had a blast here! We loved the cabin!! We had the perfect family holiday staying at this amazing cabin. We hiked in the park, walked along Deep Creek. But my favorite time was forgetting about home/work and hanging out in and around the cabin with the kids!! We have truly relaxed and are going back to South Florida feeling re energized! We will definitely be back in the fall to see the changing leaves. Thanks to the great Staff at the Great Smokys Cabin Rental. We came to enjoy some mountains and cold weather. We had a great time. The view is amazing and the beds are very cozy! Having the Christmas tree here and all ready set up was an added bonus. This was our second time here in NC and using the same company. It won't be the last! Everything about this stay was our favorite thing - The views, watching the kids play on the mountain. It was a Christmas to remember! On the drive up, the mountain side was beautiful covered in snow. This is our 2nd trip to this lovely cabin. And it never disappoints. Rainy weather meant we made extensive use of the upstairs. The views from the hot tub were also breath taking. We love going to Bryson City and walking around. Lovely little shops and great food. We also took a trip to Asheville. This time here, we got to see a lovely family of deer. They seem to like the cabin.